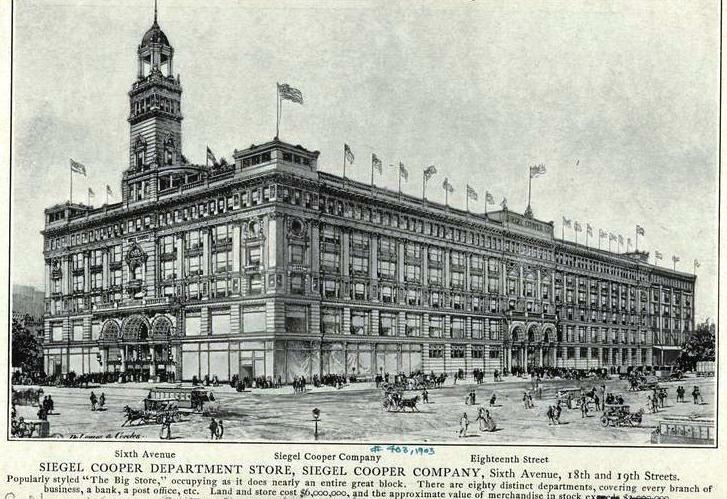 In 1893 when the World’s Columbian Exposition opened in Chicago, Henry Siegel and Frank Cooper were running a highly successful department store there. The gleaming white, monumental architecture of the fair left a lasting impression on Siegel who suddenly envisioned a store unsurpassed world-wide. Only two years later the designs had been drawn by architects DeLemos & Cordes; a colossal structure to be built on 6th Avenue – along the Ladies’ Mile – between 18th and 19th Street. It was intended to astound. 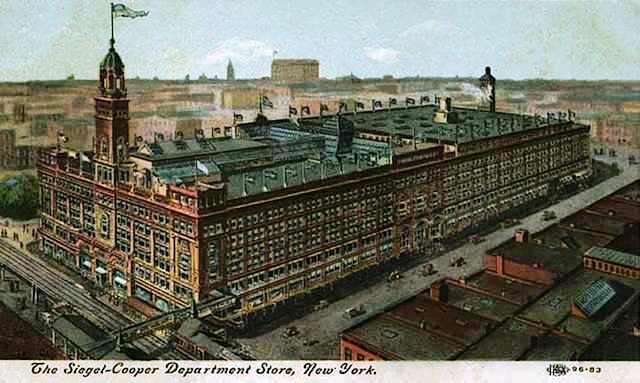 As plans were prepared for filing with the Department of Buildings, The New York Times announced on March 23, 1895 the anticipated 85,560 square foot store. Two gigantic bronze, fluted pillars supported the triple-arched entranceway. On the second floor over-sized windows allowed passengers on the 6th Avenue elevated train to window shop. A ramp enabled those same passengers to enter directly into the store on the second floor. In ornamentation, sheer size and grandeur, Siegel-Cooper outdid all competitors. Henry Siegel deemed it "The Big Store." Before long the phrase “meet me at the fountain” was a catch-phrase for shoppers along the Ladies' Mile. The day after the store’s opening in 1896, The Times reported that nearly 150,000 people attempted to enter the store. Inside 3,000 employees were waiting to serve them. “Persons visiting Siegel, Cooper & Co.’s store will be spared the annoyance of seeing over-worked shop girls behind the counters and children of stunted growth running up and down stairs. There will be separate elevators for the use of the employees,” said The Times. For its children employees, Siegel-Cooper provided a classroom and two hours of school per day. In addition to the expected goods – silverware, linens, clothing and china, for instance -- Siegel-Cooper sold groceries (canned goods were canned on the premises), furniture, pets and hardware. An enormous refrigerated room kept meats and dairy foods fresh. In the fish department, huge tanks displayed the live fish for the shopper's ease of choice. On the roof, an vast conservatory offered giant palms, orchids and rare plants for sale. Of the 124 departments, some were found in no other shopping establishment. The store offered both a dentist and doctor office, a beautician and a barber shop, a post office, an office for theatre tickets and a bank. In the basement the store operated its own plant for power, lighting, heating and ventilation. The bicycle department had a track for test rides. In September 1896 a rumor circulated that Siegel-Cooper would be offering a sale on bicycles -- $100 bikes would be sold for $9.99. Before dawn on September 14, 1896 several men in bicycle suits had lined up. By 7:00 the crowd had grown to a few hundred. There had never been any bicycles on sale that day. By 1904 Henry Siegel, whom Joseph Devorkin called “the Napoleon of the Department Store Industry,” was financially over-extended. He sold his department store to Joseph B. Greenhut for $500,000. Greenhut later reported that Siegel cried during the transaction. Greenhut’s timing, however, was bad. In 1902 Roland Macy had moved his business uptown to 34th Street, building a block-encompassing Palladian emporium. Little by little the shopping district followed. By 1915 Greenhut’s store failed. Although he reorganized and reopened, it lasted only three years, closing for good in 1918. As World War I raged overseas, Henry Siegel’s Renaissance-style palace was put into use as a military hospital. Where Edwardian ladies with broad-brimmed hats had shopped for laces and Limoges teacups, doughboys now recuperated in make-shift wards. After the war the grand structure was reduced to loft space. In 1937 the central tower was removed and at some point the statue of The Republic from the fountain was shipped off to Forest Lawn Cemetery in Glendale, California. Tishman Speyer purchased the mostly-empty building in 1987 and in 1991 exterior restoration was initiated. Now, along with most of the great emporiums of The Ladies’ Mile, the Siegel-Cooper building has been rejuvenated with new stores. 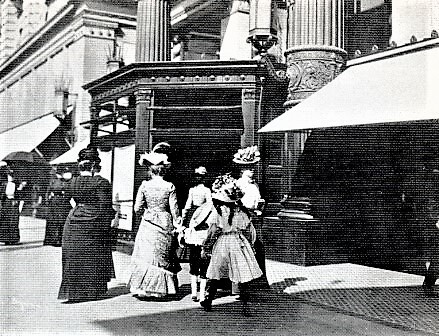 The Siegel-Cooper had little alteration to its façade even at street level and the exterior looks very much as it did on opening day in 1896. 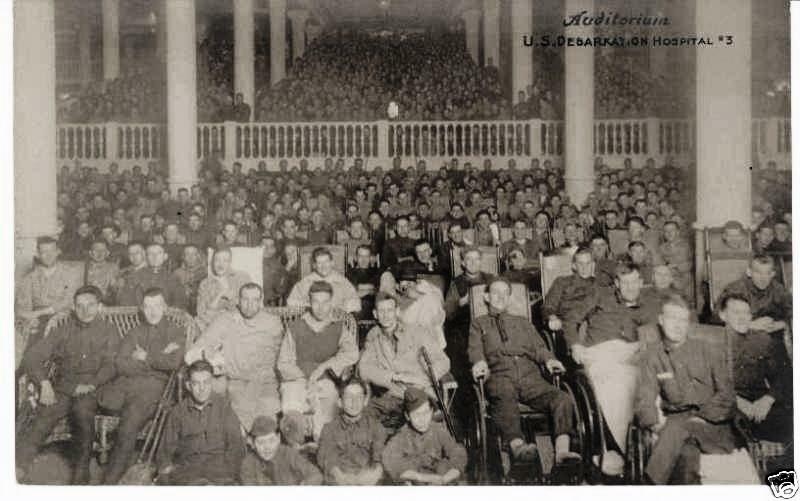 I have been reading about this hospital, also known as the Greenhut Hospital and the women who volunteered there. I used to take aerobics classes at the Actors Institute, around the corner on 20th Street, back in the mid-1980s. At that time, the Siegel-Cooper building was filthy, the magnificent entrance was almost entirely boarded over, and there was just a makeshift door in the hoardings, which served as an entrance to some kind of vocational high school. I'm no fan of TJ Maxx and big-box stores, but I confess I'm thrilled that their arrival allowed this beautiful building to be restored to its original glories. Great history. Thanks for posting. Love this stuff. So nice its still standing. In the 50s and 60s NBC's Scenic Studio was in the building.